Birth of Gilbert Rubery recorded June quarter 1891 at Dudley. 76 Dudley Road, Tipton, Staffs. William Benjamin Rubery (48, Chain & Anchor Works Manager, born Brierley Hill), his wife Mary Elizabeth (39, born Newcastle, Staffs), and their 7 children: Ethel Bernice (22, Governess in Private Family, born Tipton), Conrad Birch (18, Clerk in Chain & Anchor Works, born Tipton), Dorothy Muriel (16, born Tipton), John Bertram (14, born Tipton), Hilda Winifred (11, born Tipton), Gilbert (9, born Tipton), and Norman Huson (3, born Tipton). Also Sarah Poole (18, Domestic Servant, born Tipton). 8a Tipton Road, Woodsetton, Sedgley, Staffs. William Benjamin Rubery (58, Managing Director of Chain, Cable & Anchor Works, born Kingswinford, Brierley Hill), his wife Mary Elizabeth (49, born Newcastle, Staffs), and their 7 children: Dorothy Muriel (26, born Tipton), Norman Huson (13, School, born Tipton), and Marjorie Joan (7, born Tipton). Also Eva Sheen (20, Domestic Servant, born Wolverhampton). 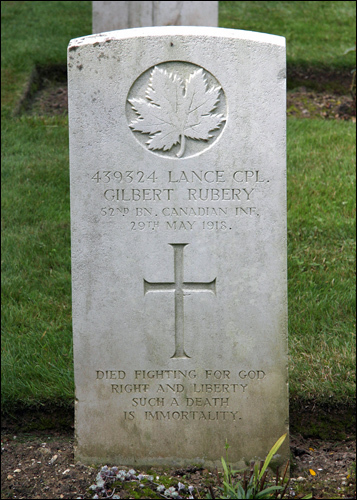 Gilbert Rubery had emigrated to Canada by 1911, where he worked as a Bank Clerk for the Canadian Bank of Commerce. He enlisted with the 52nd Battalion (Manitoba Regiment) on 31st May 1915 at Port Arthur, Ontario. Gilbert nominated his father, Mr W.B. Rubery of Hill Crest, Woodsetton as his next of kin. At enlistment Gilbert was 24 years old, having been born on 16th May 1891 in Tipton. He was 5 feet 9½ inches tall with a 35 inch chest. He had a fair complexion, blue eyes and brown hair but with a white patch of hair on the right side of his head. His religion was Church of England. The youngest son of Mr W. B. Rubery, Woodsetton (Norman), has been gazetted second-lieutenant and will join the York and Lancaster Regiment. He enlisted in 1915 in the Coldstream Guards. 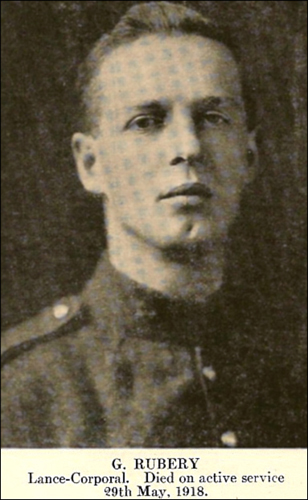 Mr. Rubery has three sons in the army, namely: Lieutenant Jack Rubery, Royal Engineers (from West Africa); Lance-Corporal Gilbert Rubery, Canadian Contingent from Ontario, and second-Lieutenant Norman Rubery, as above. Mr. Rubery’s eldest son (Conrad) has been transferred from the British Ministry of Munitions, New York, U.S.A., to the Ministry of Munitions. He is now engaged on important war work in Yorkshire. A large circle of friends of the young officer (and whose sympathy will go out to his parents) will be grieved to hear of the death of Lance-Corporal Gilbert Rubery. He was one of the three sons of Mr W. B. Rubery, of Woodsetton, who joined up to fight for King and Country. He died in France of pneumonia on the 29th of last month. His brother 2nd Lieutenant Norman Rubery, of the York and Lancaster Regiment, has been wounded whilst Lieut. Jack Rubery of the Royal Engineers, is still serving in France.